Just me being me: Another sneak peak! Today's post is of the Twiddleybitz Shadow box that I did as part of this recent assignment. I loved incorporating the the 'Home Sweet Home' pack which included the house tree, wording and embellishments into this project. I can't wait to get it back and hang in proudly at home! 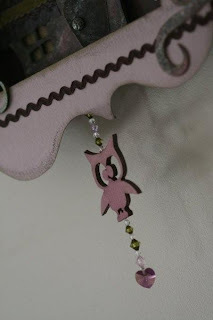 I have incorporated some different products on this one including some beautiful Crystals in the hanging owl charm. This one is a must to check out in real life as it is hard to show it all in the photos. So you will have to get yourself down to the craft show in Perth and future shows around the country to see this one! But for the full pic of this project, go to the Twiddleybitz DT blog. Have a great day, and tomorrow I will post the last of the Twiddleybitz assignment!